With the prevalence of disinformation websites, and the increasing sophistication with which these sites are being operated, readers may be uncertain which websites to believe and which to ignore. 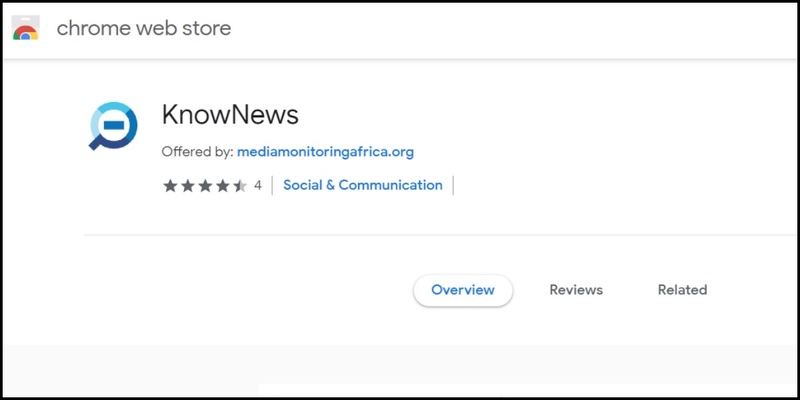 Media Monitoring Africa is driving several campaigns aimed at strengthening the public’s trust in the media, including two tools that are particularly useful in the context of fake news. KnowNews is a browser extension (or addon) that queries a database of known fake news websites. It makes use of “whitelist” and “blacklist” systems that warn you if a website has been marked as safe, dodgy or one that has not yet been classified. While it is dependent on user data to identify and flag dodgy websites, the browser extension makes it easy for a user to add a website directly from the page itself. Open and Disclose aims to provide a platform for media organisations, journalists, columnists, and commentators to make their interests public, with the aim of strengthening institutional credibility, accountability, transparency, and trustworthiness. In a time of increasing scrutiny of the media, it is critical that journalists and media houses adhere to best practice, which will also serve as an essential means of self-defence. Strengthen the media’s institutional credibility, accountability, transparency and trustworthiness. Encourage a media environment built on transparency, credibility, accuracy and facts, thus improving the levels of trust between the media/journalists and the public. Ensure a media that continues to hold the powerful (politicians and corporations) to account, applying the same standards to their own organisation, allowing their audiences to hold them accountable, and ultimately creating a relationship built on transparency, credibility, trust and accuracy. Currently, there isn’t a similar system that will meet the requirement of a simple, centralised place for local media organisations, journalists and media practitioners to declare their interests. Some media organisations disclose some interests on their websites, but this is largely organisation focused and lacks individual-based disclosure from journalists. Due to this gap, it is difficult for an organisation or individual to easily disclose this information to the public. Open and Disclose aims to bridge this gap and provide a credible, independent platform for journalists and media platforms to register their interests.